Thirty years of Air Bearing Design experience made it possible to have a fully loaded spindle (including clamp and disk) that can accelerate at 40,000 rpm/sec pulling only 8 amps of peak power. That means 20,000 rpm is available ("locked on" velocity control) in half a second. 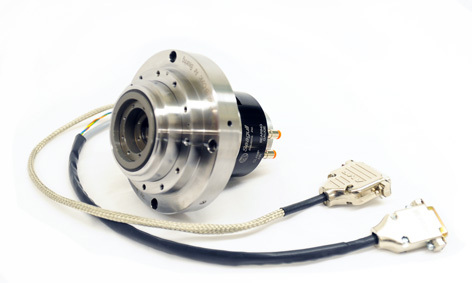 This spindle is designed to increase throughput and profitability in any application. Designed as a modular cartridge it can be adapted to most existing applications with little effort. It has true plug and play compatibility with most existing OEM equipment in use today. Offering a new three year warranty the bearing will pay for itself many times over. Additionally it consumes only 11 cubic feet/HOUR of air saving costly clean, dry air. Purchase this "Investment Grade" spindle to lock in profits for years to come. Please contact us at info@seagullsolutions.net or contact our office at 408-778-1127 to discuss your product requirements.